1st match of Carlton Mid Tri-Series has been played between Australia and England at Sydney Cricket Ground, Sydney today. Australia with good all-round cricket won the match by 3 wickets. DA Warner was hero of the match. He smashed 127 runs. But, MA Starc (Australia) declared man of the match for his 4 wickets. Earlier, England won the toss and decided to bat first. England could not made batter start and lost 2 quick wickets in very first over. IR Bell and JWA Taylor gone for a duck in 1st over of MA Starc. JE Root also departed scoring just 5 runs and England were in trouble. Skipper EJG Morgan tok charge with MM Ali and played superb inning of 121 runs and put good score of 234 runs on board for Australia. 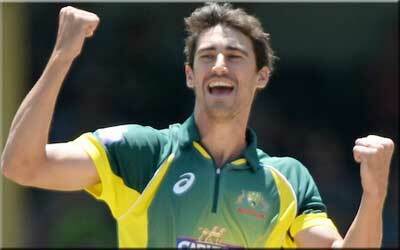 MA Starc picked-up 4 wickets and JP Faulkner picked-up 3 wickets for Australia. Following target of 235 runs, Australia started inning with DA Warner and AJ Finch. DA Warner played splendid inning of 127 runs from the top and put Australia in winning position. SPD Smith also contributed 37 runs befor he bowled by M Ali. Australia won the match by 3 wickets when 61 balls spare to bowl. Australia got bonus points for finishing game early in 39.5 overs. Australia got 5 welcome points (4 + 1 bonus) and England yet to earn points.